Hey everyone. I LOVE THIS DIY! 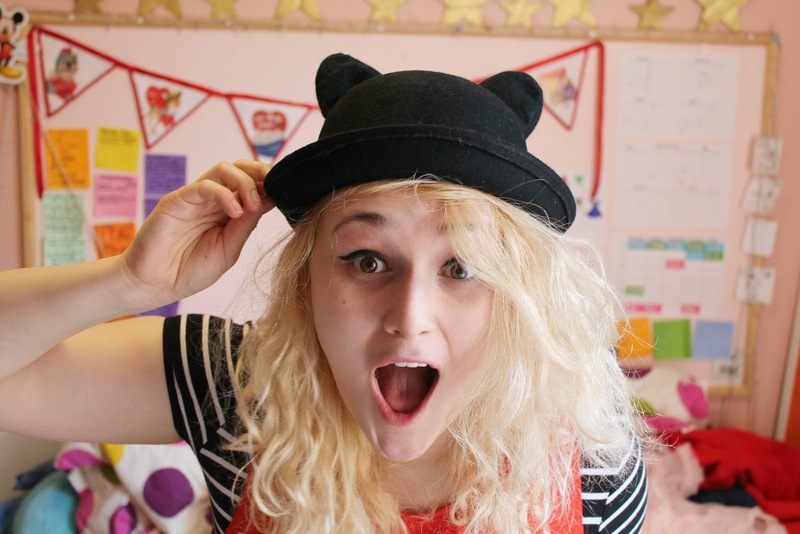 Since I made this hat I have worn it literally every day and I love it. 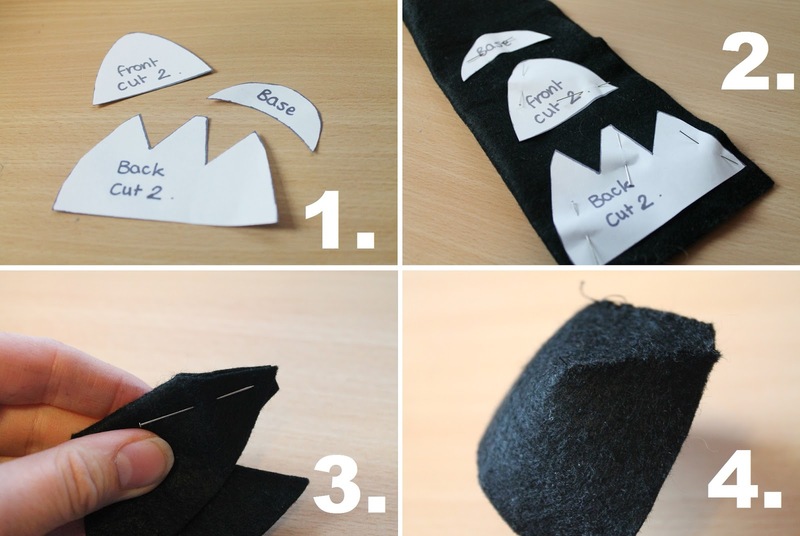 It is relatively easy to make if you have basic sewing skills. But if not I think I shall be selling them in my shop this summer so stay tuned. -This is really easy to make. 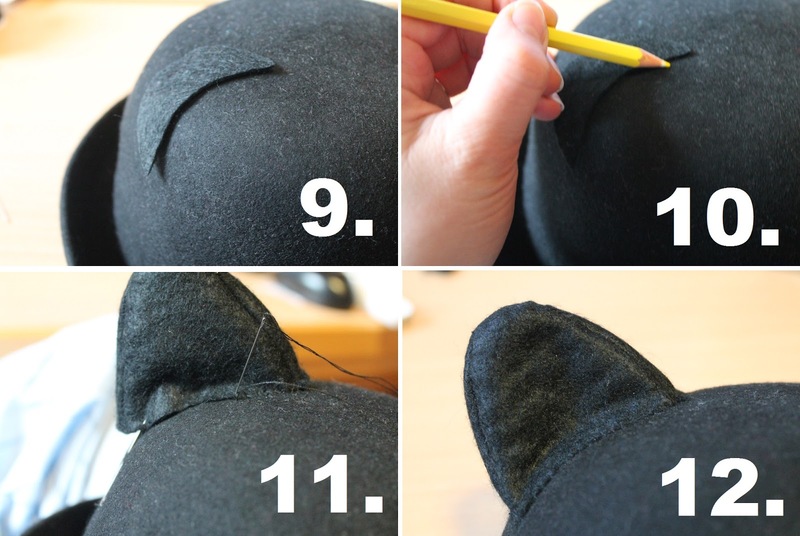 Firstly draw a cat ear shape that is curved at the top rather than pointy. Then draw a second cat ear that is slightly smaller than the first shape. Now cut two triangles out of the larger ear shape as shown below. If you are using a base template as well draw a crescent moon shape. The outer line needs to be round about the same length as the base of your larger ear shape and the inside the same length as your smaller one....it's easier than all that sounds! 1. Cut out your template pieces. 2. Cut your felt pieces. The base piece is optional if you are low on fabric since it is just used as a marker but I like to work with it in fabric as it's more flexible and accurate to how the fabric will lay. 3. 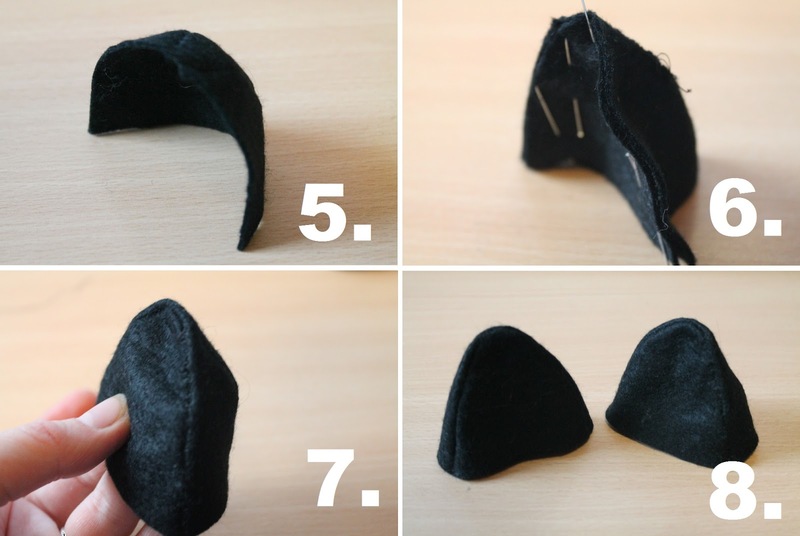 Take your back pieces and fold the V shapes in on themselves and sew down these seams. These darts will shape your ears and give them a 3-d look. 4. After sewing your darts your ears should look like this! 5. And inside out they should look like this. See that nice curve? 6. Now sew the front piece onto the back piece. Remember that when you pin your front on you need to be able to see the seams of your back piece otherwise when you turn it inside out the back seams will show. 7. Turn inside out and admire. 9. Use your base piece as a marker for placement on your hat. 10. Using chalk or light pencil mark on your placement. 11. Now sew on your ears. Sew the front line first to make totally sure they are straight. Have fun with this one, it is the coolest hat to own. And if anyone makes a pink version I want to see it straight away!